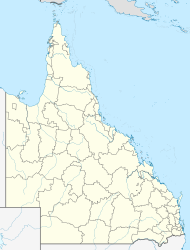 Kulangoor is a locality in the Sunshine Coast Region, Queensland, Australia. It was known as the home of The Big Cow for many years. The Bruce Highway forms the eastern boundary of the locality with the Nambour Connection Road running immediately parallel to it. The North Coast railway line traverses the locality from the south to the north. The eastern part of the locality is in a valley (approx 30-40 metres above sea level) and this is the developed area of the locality, including small farms and rural residential use, all freehold. There is also a large Kulangoo lawn cemetery operated by the Sunshine Coast Regional Council at 31 - 89 Ackerman Road. The highway and rail also pass through this valley area. The western part of the locality is mountainous and densely forested with Mount Wappa (200 metres about sea level) and Mount Combe (150 metres above sea level) and other unnamed peaks. Most of the north-western and western part of the locality is designated the Mapleton Conservation Park while the south-western area is the Wappa State Forest. In the south-east of the locality is the Ferntree Creek National Park. The locality takes its name Kulangoor from its railway station, which, in turn, was named on 11 April 1921 form the Kabi language word kalang meaning good. The Big Cow was built in the 1970s to attract tourists to a working dairy farm at 9-11 Ayrshire Rd. It is one of the many Australian Big Things. It was sculpted by Hugh Anderson, who also sculpted the Big Bulls in Rockhampton. The Big Cow is seven times the size of an Ayrshire cow on which it is modelled. It is made of concrete and described as "able to withstand a cyclone". After the dairy farm closed, the Big Cow remained on the property which was used for a variety of purposes. In March 2016, the Big Cow was described as "closed and fallen into disrepair". ^ a b "Kulangoor - locality in Sunshine Coast Region (entry 48710)". Queensland Place Names. Queensland Government. Retrieved 1 August 2017. ^ a b c d "Queensland Globe". State of Queensland. Retrieved 1 August 2017. ^ "Cemeteries Locality Guide". Sunshine Coast Regional Council. Archived from the original on 1 August 2017. Retrieved 1 August 2017. ^ Tatham, Harriet (14 March 2016). "The Big Cow at Kulangoor in the hinterland of the Sunshine Coast is closed and fallen into disrepair". ABC News. Archived from the original on 2 August 2017. Retrieved 2 August 2017. This page was last edited on 18 March 2019, at 04:44 (UTC).